This screensaver is the perfect, stylish decoration for your desktop. If the court of the cold season, the screensaver will be a reminder of Crocus summer. Enjoy free flowers screensaver now! 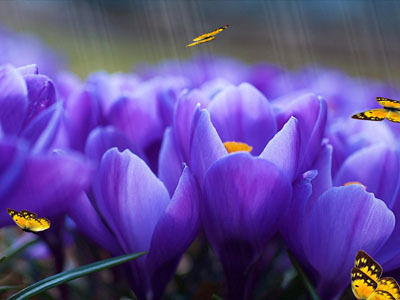 We are pleased to introduce our new, bright and colorful Crocus screensaver! Realistic graphics scene animation, bright spring lights and the stunning beauty of the Crocus flowers will not leave anyone indifferent. This screensaver is the perfect, stylish decoration for your desktop. If the court of the cold season, the screensaver will be a reminder of Crocus summer. Like all of our screensavers it is very easy to install and completely free. Just a couple of seconds and you can enjoy dancing butterflies in summer colors! Enjoy free flowers screensaver now! LoveHearts is a free screensaver from a collection of new free screensavers from http://www.newfreescreensavers.com features small nice beating hearts creating one beautiful big heart. Download free screensavers. No spyware, no adware, virus-free.